Mod The Sims - Greenhouse tip! Replies: 21 (Who? ), Viewed: 837 times. Are your plants are stuck in "just planted" mode (i.e. A little mound of dirt), and never seem to grow? Then, all you need is the stupid 2000$ sunlamp. 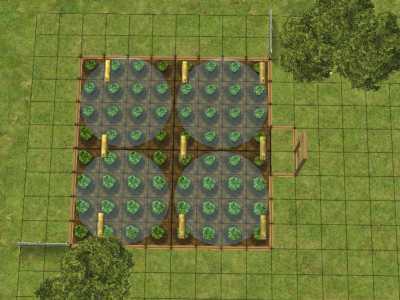 It will help all the plants exactly one tile away to grow up big and strong (So, 9 tiles in total)! No, I have no idea why this happens. Somehow, my greenhouse has both plants growing find, and those that will only grow with the fricken lamp! Plants need either sunlight or (if under a roof or greenhouse roof) the greenhouse lamp to grow, because it mimicks sunlight. So it's not so weird after all. It's been a while since I tried to grow a garden ingame, but I think the water sprayer has a 3x3 (or 4x4?) tile limit, too. I don't have problem growing anything in or out a greenhouse. Nothing stays in just planted mode very long. I don't know why you'd need a growlight in a greenhouse, unless you're not using the greenhouse walls and roof all around. They let in all the sunlight you need. I suppose if you're using that Riverblossom house that has a greenhouse roof on part of a normal house, they might need a growlight; or if, for some reason, you put a normal roof onto greenhouse walls. But all my greenhouses are normal greenhouses and don't need growlights. The only thing I've ever used growlights for was to keep a plantsim from passing out at night. I suppose you'd need them if you were simulating growing weed in a basement, or a hydroponics lab. Greenhouse walls and roof also make a room count as "outside" as far as weatherproofing is concerned, so keep an eye on your kids when they're working in one. In my experience, it warms up chilly sims. They spin back to everyday as they enter, if they were in Outerwear outside. Though I use the walls, roof and doors of the greenhouse to build them. Really? That's realistic, since the whole point of all that glass is to concentrate sunlight and create a warmer environment; but in Depression Riverblossom, Rose Greenman is always working in her outerwear. I'm trying to remember if the sims I tried to play in the house with the glass roof got heatstroke or too chilly, back when I was a noob, but all I recall is that I had to change the roof. Getting in and out of outerwear isn't really a good indicator, though, since it depends more on how many doors they've gone through than on the temperature. Oh could be. As they still are getting indoors, so they switch clothes. But I am pretty sure, their temperature stays stable. I feel like building another greenhouse now. I've never noticed Sims getting cold in greenhouses. Never had a problem with plants growing in them, either. I've considered experimenting with the growlights to see if they make plants grow faster or produce better fruit, but with my PlantSims growing all the food for the Riverblossom Empire it really isn't necessary - the Empire has ample stocks of food already. The Sims living in the house with the glass roof, the one Rose and Jason are in initially, don't get too hot or cold indoors, but the PlantSims need the growlights even during in the day, so the glass roof is fairly pointless. Lord, yes, I hate that house! It's like the person who built it didn't understand the mechanics! The roof works like lights do - it only affects sims on the floor it's on. So there's no point in having a two-story greenhouse roof - that's another reason you might want growlights in a greenhouse, I suppose, if you wanted a towering greenhouse for some reason. In Depression Riverblossom, they have a one-story house with the greenhouse attached, lots of windows, growlights, and an absurdly large garden. I kept the swimming pool, but it doesn't do Rose that much good and of course it's almost always winter in Riverblossom. She gets a lot more use out of the bathtub I put in their bedroom. I have Daisy living in it at the moment, with her new Plantbaby and one of her brothers. They only use the main room and downstairs bathtub - I really should have them remodel, sell all the stuff they don't want, and send the proceeds to Willow to help build her new Garden in Sedona. I'm just so used to ignoring most of the house now. . . I think it depends on how many walls are greenhouse walls. I mean, in reality, all you need is the south wall and roof to be glazed, but the game doesn't figure it that way. So if you put the greenhouse in that nice little south-west nook in your sims' house, you have too many regular walls and not enough greenhouse walls. One regular wall is fine for my game, but two is too many. Could be (just wild speculation) that the garden were planted way before the greenhouse (unless you haven't)? If that has anything to do with it anyway. What's mostly annoying me is that 1/3 of my garden is growing just fine without the sun lamps. 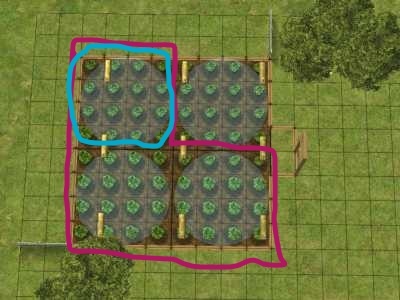 At time of writing, my garden is a bit L, of three 4x4 water sprayers, and, while one of the 16 tile blocks is growing fine, the others are not growing at all. Previously all my greenhouses haven't needed a sunlamp, so its really just annoying me that its happening now. #14 21st Mar 2019 at 6:01 AM Last edited by grammapat : 22nd Mar 2019 at 4:59 PM. I never noticed the lights making plants grow better, I just added them so I COULD see. And seems to me the sprinklers don't do anything. Neither does rain if plants are outside. Estarile, maybe if you posted a bird's eye screenshot we could figure out what the problem is? There has to be something different about the lots that aren't growing, but it's no good guessing without data. Sprinklers should suppose to water them, without manual watering of Sims. Maybe they're broken (which you can send a handy Sim to fix it)? So, I rebuilt the entire garden last night, but have done some crack Photoshop work to show where the original garden was, and which areas where causing me trouble. The pink is outlining the entire original garden, and the blue outlines the part that was growing fine. Um, the point of a picture was to see the build that was giving you trouble so we could figure out where the problem was. A picture of the rebuild isn't going to help with that. We have no idea what you changed. Well, its working with the sun lamps. Thanks for offering though. Maybe that disagree was a misunderstood...As yes, the lamp is supposed to help in growth, though I rarely use them so I cannot confirm how much they help, and the sprinklers well..they water the plants. Watering plants does help them grow, now..sprinkler or manually by sim...is there a difference? Again, I don't use sprinklers either. That disagree does not belong there but hey! That happens. I disagreed. I've had whole gardens running on sprinklers and they do something. Your sims never need to water. I wasn't the one to disagree, but the sprinklers work on both flowers and food plants. The rain works on food plants (not sure about flowers). They get brown and dripping after a rainstorm, but your sims won't need to water them for awhile. If they do, the condition will be worse because they're over saturated.